From 1844, the Rev. Thomas Ray (nonconformist minister) ran a boarding school in Fore Street for 17 boys. By the time of the 1851 Census, numbers had increased to 18, including Thomas Ray’s nephew David Evans. Pupils’ ages ranged from 5 to 15 years old. The school boasted a French Tutor. By 1854, the boarding and classical school was being run by Thomas Ray’s brother-in-law, the Rev. Daniel Evans. In the mid-19th century, Rawley’s House was the home of the butcher William Horsey, whose daughters and granddaughters retained the tenancy for a century, until the death of the last Miss Horsey in 1961. Around 1871, the Misses Horsey ran a small private school there. 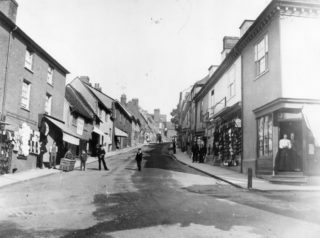 The family is found in the 1871 Census at Fore Street with William Horsey, Butcher, as head of the household, his wife Ellen, daughter Frances Ellen (Schoolmistress), daughter Maria and son Conrad. Also present were two Boarders, Eleanor (age 11) & Elizabeth R Hart (age 9), both Scholars. Miss Eliza Biggs ran a ladies’ boarding school in Fore Street during 1823-28.